Bring your game and bowl the Central Valley Masters Tournament, Sat., Aug. 25, at Freeway Lanes (8265 E. Dinuba Ave.) in Selma (559/896-2211). Squad times are at either 10am or 2pm. This is a handicapped tournament (80% of 220). Cost to enter is $60 and first place is guaranteed $1,000! There will also be optional scratch side ($40 entry) with first place $500 guaranteed. Plus the usual handicap, scratch side pots and brackets available. And, the top female bowler of the day that doesn’t qualify still cashes!! Entrants will bowl 5 games across 10 lanes. Top 1-6 from each squad will advance to a single elimination beat half the field final. This is a smaller center, so if you want to be sure you can get the squad you wish to bowl, contact CVM at www.centralvalleymasters.com. The end of Summer signifies a Saturday when the Golden Empire USBC association always holds its annual Secretaries Workshop for all upcoming Fall/Winter league secretaries. The last couple of years this event has expanded to become League Officers’ Appreciation Day to also extend an invitation to Fall league officers to attend to help bring them up to speed on what is new for the upcoming season of bowling. The 2018 Workshop was held this past Sat., August 18th, at AMF Southwest Lanes starting at 1pm and over 20 league secretaries and officers attended. Board members of the Golden Empire USBC also attended along with the manager of AMF Southwest Lanes. Introductions of both board and league officers was the first order of business. It is always interesting to see what leagues are represented. Each league in attendance was given their USBC league packet when they arrived so they could look through it before the Workshop started. These packets contain the certification (sanction) cards from USBC that are pre-printed with the names of that league’s bowlers from last season plus there are blank ones for new bowlers this season, a league sanction form, USBC award forms, a rule book and information on secretary software. 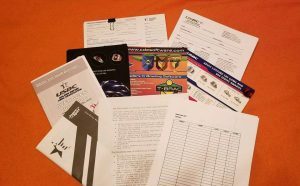 Our association manager also stuffs these packets with a league roster sheet, a sheet explaining why your league should be a sanctioned league, our local association’s award form and an average booklet. • Be sure to send in your signed league sanction form also when turning in your sanction cards. Also send in the league roster sheet and when you list those league bowlers paying, please show how they paid (by check or by cash) next to their name to help her figure out how the money she receives with these cards was submitted. • For those joining leagues, after you have submitted the main group of sanction cards, be sure to write on these sanction cards the name of the league. • Don’t hold league sanction cards off from being submitted until all bowlers have came and bowled and purchased their cards. You have (30) days from the time your league starts to turn your sanction cards in, but the sooner you do it, the faster these bowlers will get processed. The longer you wait close to the 30 days, the slower it is to get it processed because everyone else will be turning their cards in. • Our Association Manager then will give the league secretary a list back after she processes your league’s sanction cards for all your bowlers that she processed. It is the league secretary’s job to check this list against all the bowlers on their league and if someone is not on this list, then they need to find out why and let the Association Manager know. Beware of bowlers who bowl multiple leagues and say they already purchased their sanction card and don’t want to fill out a sanction card for your league. • It is important to give league award paperwork to Center Manager on duty the day/night you bowl. Do not just leave it at the desk—this is how it gets lost and never processed. A manager is on duty every shift. • Bowlmor Tournament this fall season is a tournament in January with a prize of $500,000. If interested, get an application. Two different divisions—professional and league bowler. • First night sheets that all teams are given. Please fill these out as soon as possible to get them in their system. The sooner they are in the system, the sooner you get bowler’s discounts. NEW – Senior coffee in 89 cents. • Got an up-date for our scoring system. Upload to league secretary so you can access. • Remodel will take place after the first of the year. Music will be on in sections of the house. Construction to include working on the bathrooms. • Work has been done on the lanes (AMF Southwest). • FYI – Lanes (Southwest) can communicate with front desk, they just can’t communicate back, but the desk knows what lane is calling with a problem and can get it corrected to save you from leaving your lane to run to the desk when there is an issue. The Fall/Winter 2018-19 league season starts the Tuesday after Labor Day, are you ready? Your league meetings are coming up, usually on the first day/night of your league where you need to be involved as league rules will be reviewed, a decision on what league fee you will pay and some of the leagues will be electing their league officers at this meeting. It is important that you elect individuals who will care and take the time to do their duties for your league. 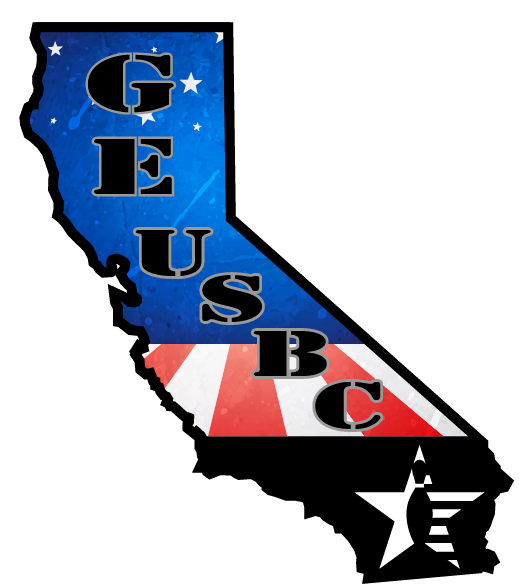 Golden Empire USBC Tournament Committee just got finished running the Bakersfield Scratch Open and this is their next endeavor and it is being run so that all proceeds can go to the GEUSBC Youth bowling program so come out and support this tournament to help the 2018-19 Youth bowlers. Cost to enter this tournament is $70 per team–$20 for the youth (17 and under); $25 for the adult (18-49) and $25 for the senior (50+). Squad times are either 10am or 2pm. Teams will bowl 3 games. This is a handicapped tournament/Beat the Board. Brackets and sidepots will be available. Register today to save your spot by contacting GEUSBC at information.geusbc@gmail.com or going on the website at GEUSBC.org. Don’t have a team? 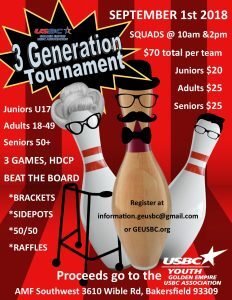 GEUSBC will help get you on a team, just contact them and let them know you are interested in bowling. Besides bowling there will be a 50/50 and Raffle at the event. Donations of raffle items are greatly appreciated. Come meet the youth bowlers currently in our youth program as well as the GEUSBC Tournament Committee! A fun day for sure!! 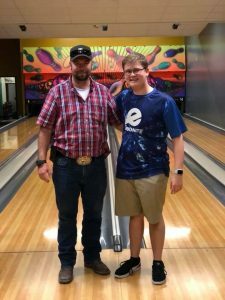 Congratulations to our local youth bowlers who bowled their way to the top standings at the CUSBC Youth Championships held the last two weekends of July at Keystone Lanes in Norwalk! Troyace Powers started off by coming in 2nd for the D Division Singles Event with games of 214/165/169 (548). But, the big one was when he became the Boys D Division for All-Events Champion! It didn’t stop there as he won the Helbing Award for being the Highest Scratch Series for Boys 11 & Under with a (1644) which he was awarded $100!! Other placers of note include Adam Waybright, who placed 5th in the B Division Singles event with games of 232/238/189 (659)! And, McKenna Powers who placed second in the Princess division of the Ancillary Event with games of 210/150/156 (516)! AMF Southwest Lanes is hosting “The Labor Day Classic” Tournament. Qualifying squad starts at 11am on Mon., Sept. 3rd (bowlers must check-in 30 minutes prior to squad start). This is a handicapped tournament (90% of 220) and 1 in 7 bowlers will cash. Entry fee is $59. $1,000 for first place (based on 55 entries). Bowlers will bowl 3 games in qualifying round and then cut to Top 8 bowlers for single-game elimination bracket matches to determine winner. – Gambling Fever – Sunday nights, 6pm, mixed teams, no-tap, league bowls sweepers in Vegas, next season started on Sun., Aug. 19th! – PBA Mondays – Monday nights, 6:30pm, Match Play Singles, 4 games individual Match Play on certified Sport conditions, handicapped 80% of 200. League bowls for 30 weeks on 3 different Sport patterns. League begins on Mon., Sept. 10. For more info, contact Diz Francisco at 599-3097 or front desk. – Vegas Funtime League – Tuesday nights, 6:30pm, teams are 4 bowlers, $18 per week per bowler. League meeting will be on Tues., Sept. 11 at 6pm (first night of league). Get 3 Days & 2 Nights in Vegas, $3,000 paid to first place team, all teams cash/In-squad cash prize drawings. Cocktail Party, Awards Dinner & Entertainment, Breakfast & Lunch Buffet. – Stockdale Open League (formerly Stockdale Men’s) – Thursday nights, 6:30pm, teams are 4 men, 4 women, or 4 mixed. League bowls for 34 weeks (32 qualifying weeks/8-week sessions), $25 per week per person, handicapped 80% of 230 (max. of 60 pins). League meeting will be on Wed., Aug. 29, at 6:15pm in the Meeting Room at AMF Southwest Lanes. League starts on Thurs., Sept. 6th. For more info or to sign up, see Front Desk at AMF Southwest Lanes. – Mexican American Men’s League – Friday nights, 6:30pm, teams are 4-men with a weekly 4-point win system. League bowls for 35 weeks. League meeting will be Sat., Aug. 25, at 5pm at Magoo’s Pizza on District Blvd. League starts on Fri., Sept. 7th. For more info, contact Joe Guerra at 809-8840. – Saturday Juniors All Stars League – Saturdays at 12 noon, starts Sat., Sept. 15 (league meeting at 11:30am on Sept. 15 in meeting room). Cost is $11 per week per child. Compete to win trophies, awards & scholarships! League runs 15 weeks. Join a league this Fall and get 20% off food & drinks, (2) FREE practice games per week, 10% off parties & events and exclusive league coupons & birthday extras! 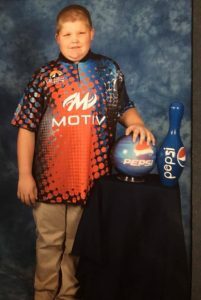 – Congratulations to Antonio Avery who bowled his first 300 game on Thurs., Aug. 16, bowling in Robb’s Ball league at AMF Southwest Lanes for his third game of the night. – And right after Antonio, the bowlers moved down the lanes to watch Mike Yorba getting set to add another 300 game to his career which he did! Congratulations Mike! – Great bowling for Michelle Davis who rolled a 269/698 series recently at AMF Southwest Lanes in the Gamblers Anonymous league on Wed., Aug. 8th. –Coffee Club* SPECIAL ALERT!!! 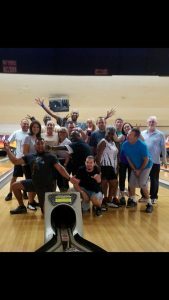 : COFFEE CLUB WILL BE AT AMF SOUTHWEST LANES ON SUN., AUG. 26TH, CENTER OPENS AT 12 NOON; BOWL AT 12:30, AND IT WILL BE 9 PIN NO-TAP WITH HANDICAP!! Handicap Doubles: 1. PD Richardson & Chris Gregory (1807); 2. Caleb “Pudge Miller & Billy Weeks (1752); 3. Roy Jones & Chester Waybright (1708). Handicap Singles: 1. PD Richardson (929); 2. Norris Richards (897); 3. Caleb “Pudge” Miller (891). 3-6-9 pot was hit by CVM brotha, Chris Gregory for $55. Carryover is now $255. Alex would like to thank Roy Jones for bringing in a couple new bowlers—Ruben & Patricia—welcome to the family! Handicap Singles: 1. Chester Waybright (934); 2. Andrew “Newlywed” Svoren (857); 3. Thomas Stancil (827). 3-6-9 carryover is at $255! Shout out to Norris Richards for his continuous thoughts and insight on how to improve our bowling club! *Coffee Club is on Sunday mornings (except this coming Sun., Aug. 26th where it will be held at AMF Southwest Lanes starting at 12:30 and this will be the August No-Tap event) starting at 11am at AMF Westchester Lanes. Cost to enter is $20 for 4 games, blind doubles draw. Optional high pots, singles, and 3-6-9. Handicapped and fun bowling with some great local bowlers! And, NEW, once a month, a No-Tap Tournament will be scheduled! !